Phantom Ganon armor is an outfit in Zelda Breath of The Wild. It’s based on the costume of a recurring villain from several previous games, a spectral, otherworldly version of Ganon. There are three parts to it – a chest piece, a skull helmet and a pair of greaves. 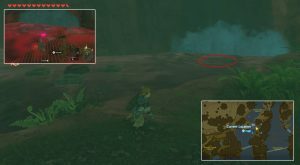 When worn, it will increase Link’s stealth, letting him sneak past enemies. Once you install the Champions’ Ballad DLC, you’ll be able to find a notebook which will give you hints about the parts’ locations. 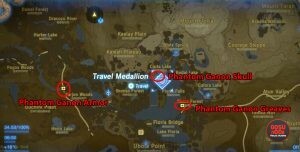 If these hints are not enough, read on and we’ll show you the exact location of the Zelda BoTW Phantom Ganon Armor. Misko’s journal says that the parts of the armor are hidden within Faron’s sea of trees. This means they’re in the vast forest in the southern part of the area, around Lake Floria. All three locations are within walking distance, so if you’re not in a hurry, you could teleport to the Faron Tower and visit them from there. The greaves can be found in a chest near the road going through Ebara Forest. The hint tells you it’s at the “broken stone bird”. The easiest way to get there is by warping to the Quakah Nata Shrine, then gliding down into the forest. You’ll see a giant rock near where the road bends – the chest will be hidden between the palm trees next to it. The helmet is at the “highest of three waterfalls north of Lake Floria”. It’s the one that transports water from Corta Lake, get to it, and use Magnesis to find the chest at the bottom of the waterfall. The armor can be found “at the bridge between small waterfalls over Floria river”. You’ll find the chest under the first bridge west from the lake, on the northern edge of the Sarjon Woods. You can glide there from the Faron Tower. Actually it has the same special effects as the twice upgraded radiant set, not a stealth bonus. Cant be detected by skeletal monsters and you do more damage with bone based weapons such as a dragon bone club. Terrible. I have looked for a half hour all over the area for the greaves and found NOTHING.